May | 2013 | Renowrites blog! 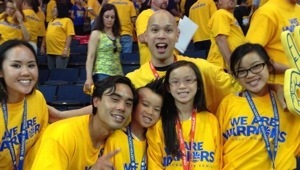 My family lives basketball, exemplified by the picture below of us on Sunday May 12, 2013 at Oracle Arena, Game 4 of the Spurs Warriors game. I’m sure this love of basketball stems from our family’s lineage of ball players in the barrio of the Philippines. Apparently my dad was a baller growing up in San Remigio, Cebu. Regardless of the reason, I find it a must to always include a basketball related scene in my writing. Speaking of which, I have 2 manuscripts done. Now I just need to get it out to the world.